… can sometimes go awry!! Last Friday, you received two posts almost at the same time. You might have guessed that one was posted in error? That’s what can happen when I try to do too many things at the same time!! 🙂 I was in the midst of preparing the first Annual General Meeting (AGM) for an association I am a member of – the Institut de l’Ancienne Abbaye de Saint-Chinian. The AGM was that day, and it turned out to be a great success – 60 members came along to the meeting! The official part was followed by an aperitif dinatoire, drinks with substantial nibbles! 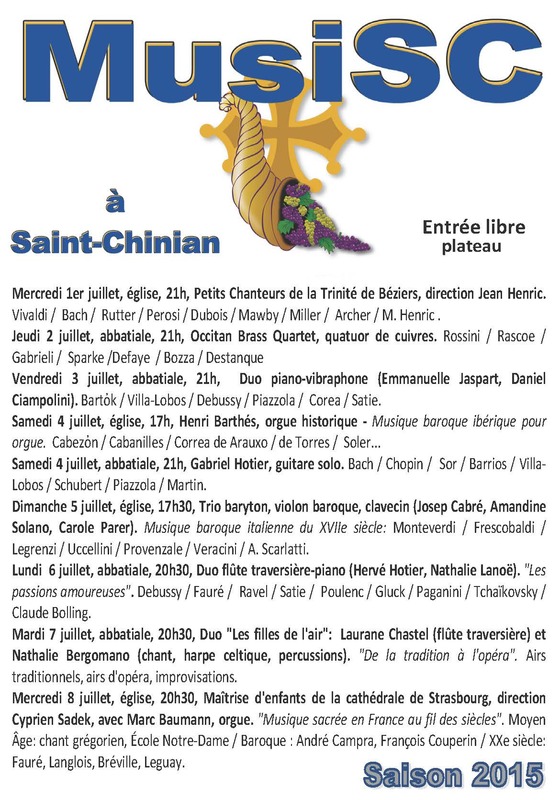 In case you are wondering, the association organises the music festival in Saint-Chinian (this year from July 23 to 29, 2018), along with other concerts through the year. You can sign up to become a member via the form on the association’s website – do join us, it’s a worthwhile cause! Music is as much part of the summer in Southern France as is the sound of the cicadas and the click of the petanque balls. There are music festivals everywhere, ranging from the very large, such as the Festival de Radio France et Montpellier Languedoc-Roussillon, to the more intimate, such as the Festival Pablo Casals in Prades, and to the modest, such as the classical music festival which was organised in Saint-Chinian this past July. The festival in Saint-Chinian took place for the first time this year – a week of concerts, nine in total, and all of them free to enter. The programme was varied, and the music ranged from Baroque to modern classical music. The concerts took place in two locations: the Abbatiale, the former church of the former abbey, a beautiful room with plenty of space for concerts, and in the parish church of Saint-Chinian. The concerts were all well attended and the next year’s edition of the festival is already being planned! Hot on the heels of the music festival came the 5th Academie Musicale de St-Chinian, a week-long programme of lessons and workshops for students of the flute. The academie was based at the Maison du Parc, not all that far from my potager . It was lovely to hear them all practising and rehearsing whilst I was working in the garden! 🙂 Having heard all those snippets of music, I was looking forward to the concert of the students at the end of the week. Ahead of the student concert, there was a masterclass with Philippe Boucly, the solo flutist from the Bavarian Radio Symphony Orchestra. Following the masterclass he gave a mini recital, which was spectacular! Here is a brief video clip of Philippe Boucly playing with Herve Hotier (flute) and Pierre Courthiade (piano). The piece is the Concert Paraphrase of La Sonnambula Op. 42 by Franz Doppler. E-mail subscribers, please visit the blog website to watch the video. The concert given by the students and teachers that evening was wonderful too, and I am already looking forward to hearing them all again next year. Walking past the open door to the parish church one day, I heard the sounds of the church organ. I walked in and filmed a little video for you – only a little taster but you’ll get the idea. The organ in Saint-Chinian is one of only three authentic 18th century organs in Herault, and it has been listed as an historic monument since 1976. There is an extensive article on Wikipedia (in French) about the instrument, with lots of technical detail, and here is another article in both French and English. The organ is not a flamboyant or extravagant instrument to look at, but it has a beautiful sound, and it fills the church perfectly. Bruno Fraisse and Henri Barthes, the former and present organists, produced a CD of the organ a few years ago. You can also listen to the instrument during Sunday service, or at one of the concerts which are given occasionally. The next concert is on September 6, 2015 at 4pm. Another concert I recently visited took place in Serignan, where I went to see the exhibition of Pierre Regis Dides – see last week’s post. The Regional Museum of Contemporary Art (MRAC) had the privilege of hosting this concert as part of the Festival Pablo Casals. A Steinway concert piano had been set up in one of the galleries on the first floor of the museum, and the space was filled with chairs. Those chairs were of course filled with listeners by the time the concert started. The musicians were Bruno Pasquier (viola), Michel Lethiec (clarinet) and Yves Henry (piano). Together they interpreted a programme of music by Mozart (Trio in E-flat major, K. 498), Schumann (Märchenbilder, Op. 113), Poulenc (Sonata for clarinet and piano, FP 184), Bruch (Pieces for clarinet, viola and piano, Op. 83) and Maratka (Sylinx). The musicians’ love and passion for what they were playing was infectious! Michel Lethiec played a solo piece called Sylinx, which was written for him in 2000. In his introduction to the piece, he reminded the listeners that contemporary music is as important now as it was in Mozart’s time. Audiences then were as little used to “new” music as we are now. Mozart is “easy” to listen to for most of us nowadays, but it was probably fairly radical to the ears of people at the time. Whilst I found the piece by Maratka to be challenging, it was also very rewarding to listen to. Here is part of it – I hope you enjoy it too! At the end of the concert, Michel Lethiec explained that he had to rush off to his next concert, as he is the musical director of the Pablo Casals festival. He left Yves Henry to play another piece for us, a beautiful Chopin nocturne!! What a lovely end to a great afternoon!